Welcome, readers! 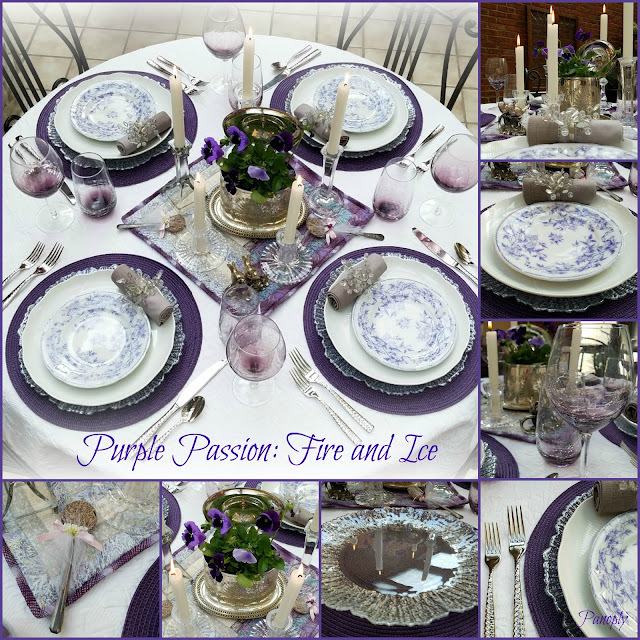 Today I'm sharing a tablescape I've dubbed as "purple passion: fire and ice" to warm your winter day, spark some friendly conversation and, hopefully, deliver some inspiration for an inviting table setting. 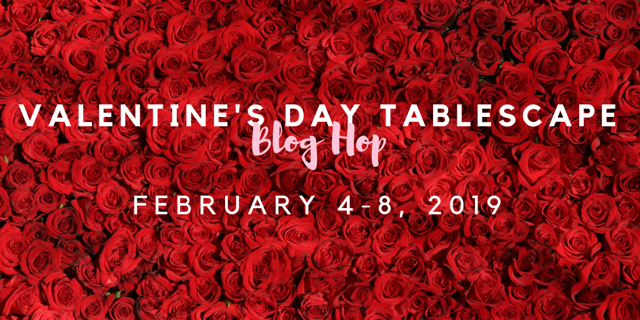 This week I am celebrating a table set for Valentine's Day, along with a group of other stylists, graciously hosted and organized by Chloe Crabtree from the blog Celebrate and Decorate. 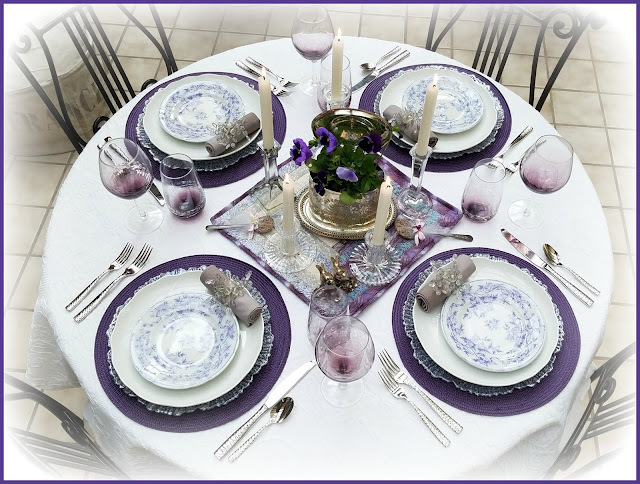 My table today is set for four, perhaps to be shared with a favorite couple for Valentine's Day, or maybe three girlfriends, a la Galentine's Day style. 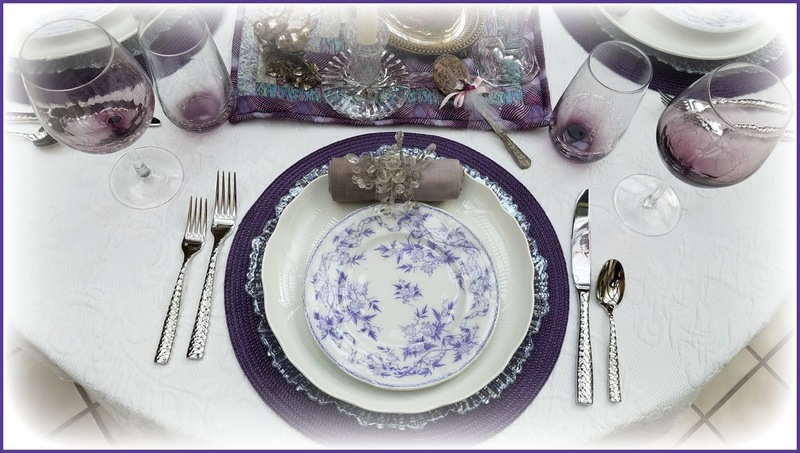 The table begins with a matelasse cloth as the base, as white as fresh fallen snow. 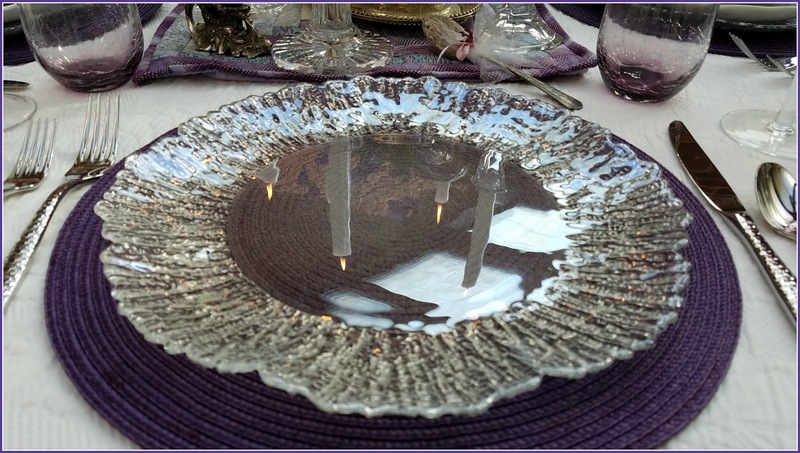 The glass chargers are like puddles with ice rings, sitting upon placemats in regal purple. Candlelights reflected in the charger's center are subtle mood enhancers at the table. Dinner plates are classic, Mikasa '.Magnolia'. The lavender transferware salad plates were a vintage find last summer. They are circa 1880, made and marked Epine U & C Sarreguemines. Utzschneider and Company was a porcelain company that made ceramics in Sarreguemines, Loraine, France from about 1775. 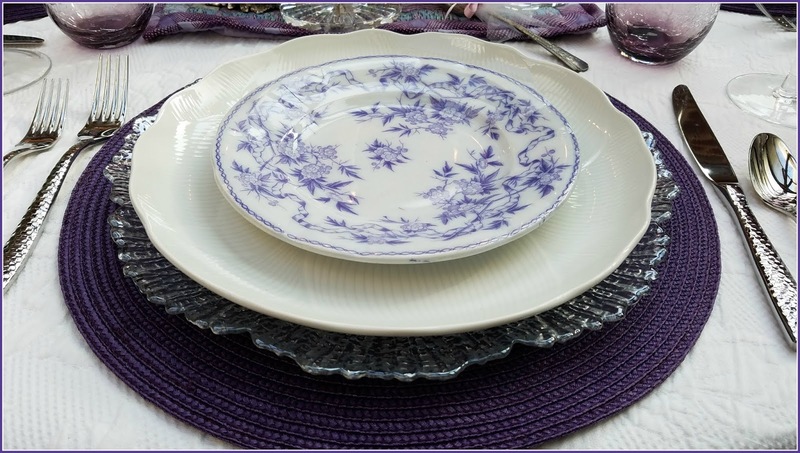 Transferware, like these plates, and majolica pieces were made by U & C in the late 19th century. Gray napkins are reminders of typical winter skies, rolled and bound with beaded rings that mimic ice pellets. 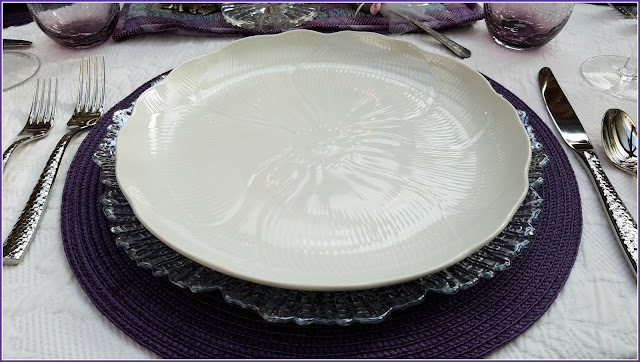 The purple stemware has a crackled base, like frozen water in winter. 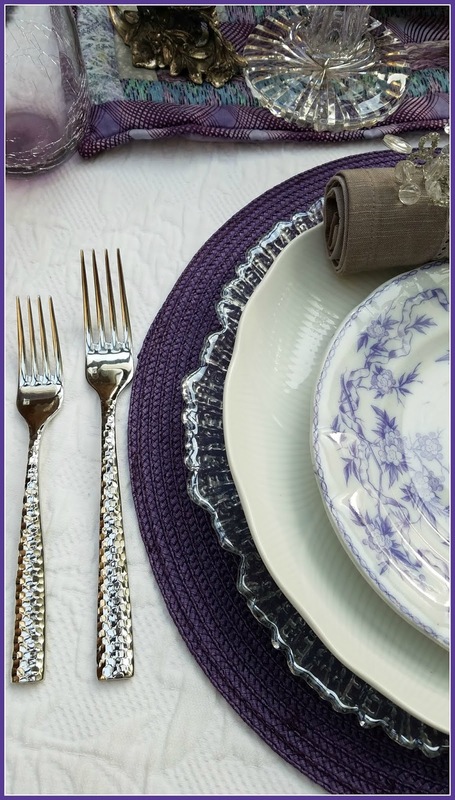 The flatware is Fortessa 'Lucca', nice and solid in weight. 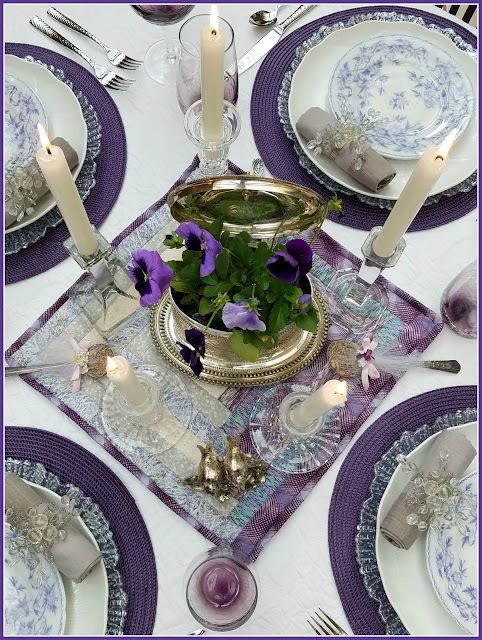 Candlesticks of varying heights are a mix of high and low (both in profile and price points), placed on a vintage quilted mat in the center of the table, made by artisans from a well-known WV co-op. Two silverplate birds (salt & pepper shakers) are perched nearby. 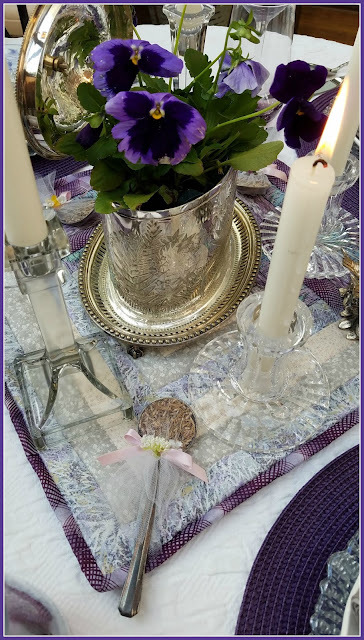 The pansy plant (from the 15thC French word, pensée, meaning thought or remembrance) was simply "planted" in the circa 1880 Atkins Brothers Sheffield silverplate biscuit box inside a plastic bag. The pansy is part of the viola family, a European wildflower, and is a wonderful early spring flower which can also be enjoyed as a winter planting in Southern regions. Its fragrance is sweet, and the flower is edible. 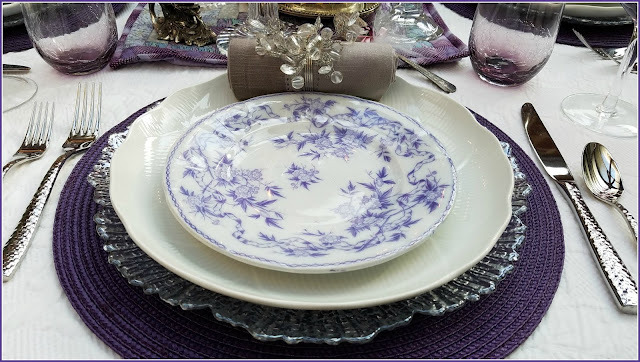 In the Victorian language of flowers, where open display of affection or love was frowned upon, the pansy was a secret courting symbol of love or admiration. I am using the term purple loosely in this case, as this plant variety shown is actually known as blue blotch. 😊 Vintage soup spoons are filled with lavender buds tied with tulle, ribbon, and vintage millinery florals. 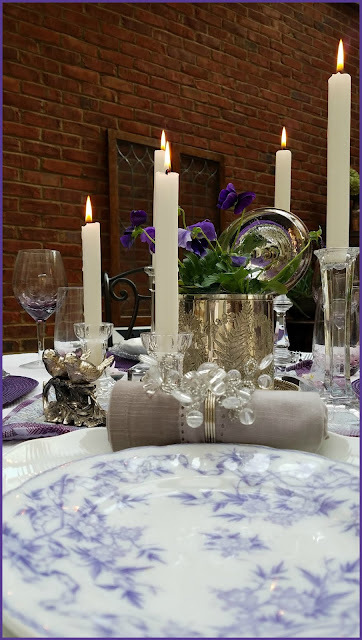 Whether you're hosting Valentine's, Galentine's (love with your gal pals), or just enjoying an ordinary, quiet dinner by candlelight, I hope you've been inspired with even one idea as a takeaway from my tablescape today. For plenty more inspiration, please see the complete list of bloggers participating in this gathering below, and links to their tables. Each day different bloggers are featured, and the links are updated to take you right to their posts. Be sure to check back to see them all. To Chloe Crabtree - a special thank you for organizing this event! Tablescapes are but one subject on my blog, and you can find other topics on the main menu at the header of my blog. If you're on a mobile or handheld device, just scroll to the bottom of your page and click on web version to see the menu. You may also search topics with keywords, or by labels, both options located on the sidebar of my web page. Feel free to leave your comments so I'll know you stopped by. Please note that Google+ Support Team announced February 1, 2019 that all Google+ pages and its features are going away (or have already) by April 2019. This includes the Google profile pages and feeds, followers, + button, and comment feature, so if you try to leave a comment on my page and cannot, it is because that function was disabled by Google, not me. All past Google+ comments will disappear. I am on the Blogger platform, and am now using Blogger comment function. If you cannot leave a comment, I will appreciate an email at wv.panoply@gmail.com letting me know. I would love for you to follow my blog by email with Feedburner subscription (sign up is on sidebar, just below the labels). Interaction with readers is one of the things I value most in blogging, and I don't advertise or sell your email to anyone. Thank you for your visit today.